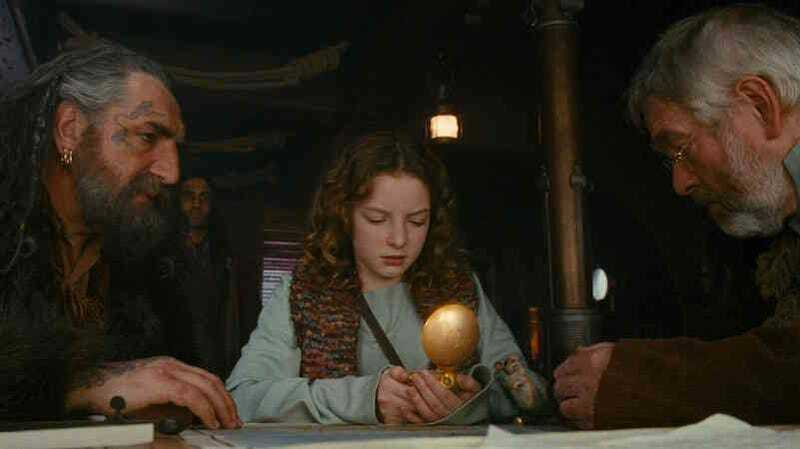 With the announcement that the long-awaited follow-up to His Dark Materials will be hitting bookshelves this October, we’ve dredged up every buried thought about Philip Pullman’s universe we’ve kept inside for 17 years. Now we’re letting loose with some thoughts about everything we that think should be in the new trilogy. Note: These books are 17 years old now, but still, be aware that some plots points are discussed in depth. The Amber Spyglass ended with basically God dying, and his regent tumbling into an abyss. That’s... not a small thing to deal with. And yet, in Lyra’s Oxford, set two years after that book, it doesn’t seem like Lyra’s world has been nearly shaken up by this event as it should have been. Were all of Lyra’s adventures hushed up? Because the ruling church of Lyra’s world entered in a giant war and they basically lost, so I feel like there should be some huge repercussions for that. The completely twisted relationship between Lyra’s parents was always a compelling part of His Dark Materials. Pullman says that he “discovered a long story that began when she was a baby and will end when she’s grown up,” and I am hoping that the part where she was a baby will cover a lot more of her parents, because we only know what happened to them through a secondhand account. Actually seeing them in that early stage would enrich the original trilogy. Mrs. Coulter was a woman of brilliance and ambition. And one of the ways she gained power in Lyra’s world was through the experiments she conducted on Dust, children, and their connection to their daemons. It’s such a dark way to go that I’m curious—less about Mrs. Coulter, but more about the people in Lyra’s world that sanctioned the experiments and what led up to them. The Amber Spyglass ended by separating Will and Lyra to their respective worlds, but with them each promising to go to their equivalents of Oxford’s Botanic Garden and sit on a bench so they could, sort of, be together. At the time, this bittersweet ending for these two characters was a revelation, since every other YA book I’d read up to that point went with pretty much unambiguous happy endings for the main couple. But in any follow-up, we’re dying to see something further between these two. When we left Lyra, she had lost her ability to read the alethiometer through instinct, and was stuck learning to interpret it the way everyone else did: through study and use of reference books to decode what the symbols stand for in that specific situation. Lyra’s use of the alethiometer was a vital part of the books and an important part of her identity, so I’m desperately curious about how she deals with having to re-learn to do something she used to do so easily. I could say something deep about wanting to know how their society is doing in the wake of everything—or even ask to see things before and after Iofur’s reign—but let’s be real: I just want to see more of the panserbjørn, the Viking-like polar bears who live in the North. We all love the panserbjørn. Pullman has said that His Dark Materials is a retelling of John Milton’s epic poem Paradise Lost. Except, of course, Pullman’s version depicts the “fall” as a positive thing for humanity. Growing up, discovering sexuality, gaining knowledge are all “benefits” to the “fall.” Given that influence, I wonder if Milton’s other work will be alluded to in Book of Dust. Paradise Regained retells the temptation of Christ, and the obvious allegory would be to put Lyra in the Christ role, but maybe she’s taken up the role of Satan from her father. Pullman has stated that William Blake—whose extremely vibrant visions clearly did have some impact on the other books—shapes the new book a lot. “The story I’m telling in this book is more about in terms of William Blake’s vision, his idea of a fiercely reductive way of seeing things: it’s right or wrong; it’s black or white,” he said. Expect a lot of shades of gray. Only one portal between worlds remains open at the end of His Dark Materials. It links the world of the mulefa—large pachyderm-like animals who use the seed pods of their world’s trees as wheels they attach to themselves—to the world of the dead. This fulfills their promise to help the shades leave the world of the dead. But it also means the mulefa have a bunch of shades wandering their world now. What does a world where the dead and thinking, tool-using animals coexist look like? Is it eerie, or do the mulefa just get used to it very quickly? We’re curious about Pullman’s universe in general. His new trilogy announcement mentioned a boy going to a new world. Assuming that’s not a metaphor, we should be getting more multiverse adventures. Will and Lyra’s worlds seem pretty classical parallel universes—similar, but different. Cittàgazze has other elements that tie it to those places. But the mulefa world is completely different. The land of the dead is also not really a parallel history planet. So do alternate universes, different realms, and wholly different planets just stack up all willy-nilly? I’m dying to know. It’s kind of implied in His Dark Materials that everyone in all the worlds have them, but that not everyone can see them. That’s why Will has one, and why Mary manages to see one. Pullman said he’s going to spend time on daemons in this new book and we have questions. Lyra’s world is the only one we’ve seen where they’re visible, why is that? The mulefa can see dust; do they just not have daemons because they’re animals? And why do humans have them, but other thinking and talking others don’t? We do know, from The Golden Compass, that dust creates the link between people and their daemons. So if we’re getting an investigation into dust, we should be getting some interesting revelations about daemons, too. Pullman has said there will be “some characters who are new to us, including an ordinary boy (a boy we have seen in an earlier part of Lyra’s story, if we were paying attention) who, with Lyra, is caught up in a terrifying adventure that takes him into a new world.” Please speculate about that in the comments. I’m going to be re-reading the books trying to spot him.